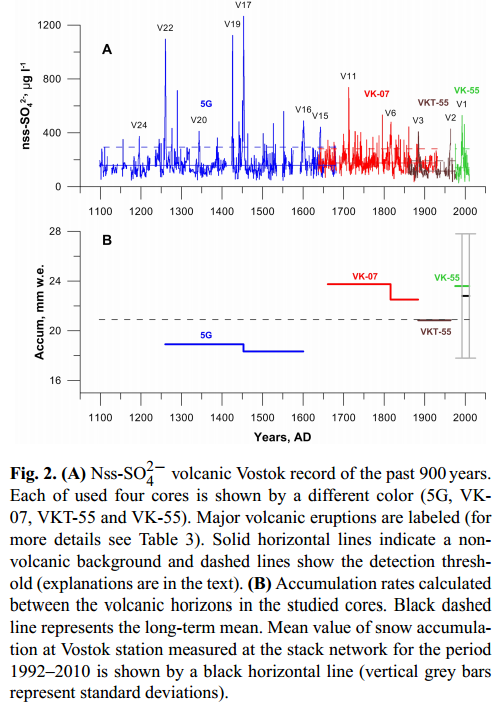 A new paper published in The Cryosphere reconstructs climate in Vostok, East Antarctica over the past 900 years and finds snow accumulation from 1992 to the end of the record in 2010 was at the highest levels of the past 900 years. According to the paper, snow accumulation from 1992-2010 was 13% higher than the 900 year mean. Bottom graph shows snow accumulation in mm water equivalents was at the highest levels of the past 900 years from 1992-2010. Dotted line shows the long-term mean. Snow accumulation was also at these same high levels from AD 1661 - 1815. Abstract. Ion chromatography measurements of 1730 snow and firn samples obtained from three short cores and one pit in the Vostok station area, East Antarctica, allowed for the production of the combined volcanic record of the last 900 years (AD 1093–2010). The resolution of the record is 2–3 samples per accumulation year. In total, 24 volcanic events have been identified, including seven well-known low-latitude eruptions (Pinatubo 1991, Agung 1963, Krakatoa 1883, Tambora 1815, Huanaputina 1600, Kuwae 1452, El Chichon 1259) found in most of the polar ice cores. In comparison with three other East Antarctic volcanic records (South Pole, Plateau Remote and Dome C), the Vostok record contains more events within the last 900 years. The differences between the records may be explained by local glaciological conditions, volcanic detection methodology, and, probably, differences in atmospheric circulation patterns. The strongest volcanic signal (both in sulfate concentration and flux) was attributed to the AD 1452 Kuwae eruption, similar to the Plateau Remote and Talos Dome records. The average snow accumulation rate calculated between volcanic stratigraphic horizons for the period AD 1260–2010 is 20.9 mm H2O. Positive (+13%) anomalies of snow accumulation were found for AD 1661–1815 and AD 1992–2010, and negative (−12%) for AD 1260–1601 [during the Little Ice Age]. We hypothesized that the changes in snow accumulation are associated with regional peculiarities in atmospheric transport.